Cascade Ski Touring Center in Lake Placid was the site of yet another memorable full moon party last Saturday night. Owner Art Jubin has been organizing these parties as long as I can remember - twenty years - and they are still a huge hit. The parties happen on the Saturday closest to the full moon, each month during the winter. 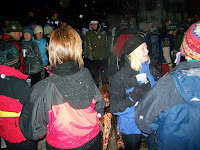 Bonfires and kegs of beer are arranged along the illuminated cross-country ski trails as destinations for full moon revelers. When tired of braving the cold, skiers head to the warm and hopping bar for dancing to live music. The best part of the evening for me is x-c skiing for hours under the full moon's light reflected off the snow. It is beautiful and one of my favorite Adirondack experiences - and I don't even drink beer! This weekend's party was extra special because we had extra special visitors. A big thanks to my trusty sidekick, dance partner and photographer Ed, for taking the bonfire photo!